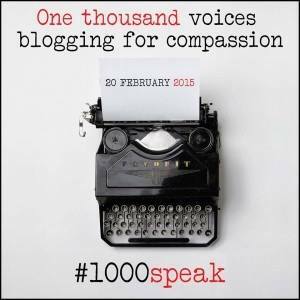 More than 1,000 bloggers from across the world are writing today with the intended goal to share and encourage compassion. The world is hungry, almost desperate, for this united effort. My contribution is to promote compassion for the old souls among us. My mother was dying. Her breathing had changed over the past few days; irregular, pausing only to alarm us, then continued with a raspy rattle. My daughter and I sat beside her bed and held her hand, limp and translucent, as Tennessee Ernie Ford sang about peace in the valley. Gentle Hospice workers came silently during her last week to shift her body and dab a damp sponge on her lips. Though they didn’t know her, they treated her with the dignity and grace she deserved. 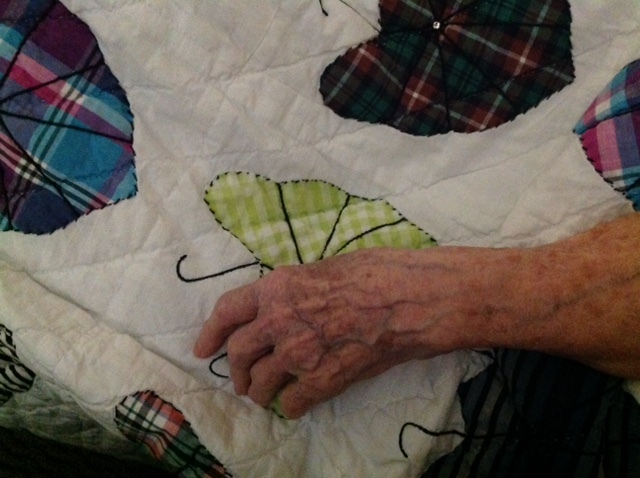 Outside her room at the assisted living facility, other residents shuffled by, some with walkers, as silent sentinels in the last act of the drama of life. 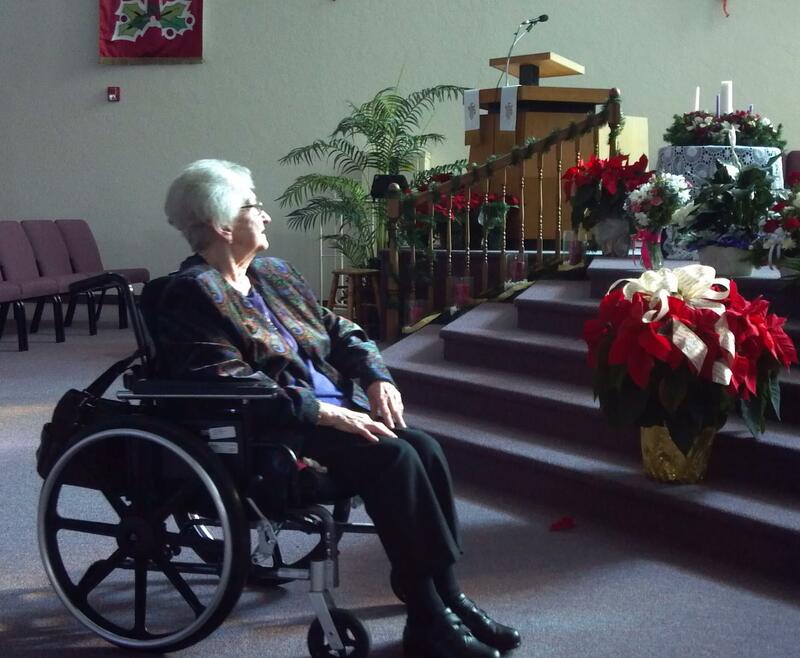 After 87 years, my mother’s body and mind were gone, except for her strong heart. We could do nothing but wait. According to the National Center for Assisted Living, more than one million senior citizens live in assisted living facilities in the United States. There are horrible reports of abuse and mismanagement, but most of the staff members are loving and responsible caregivers. 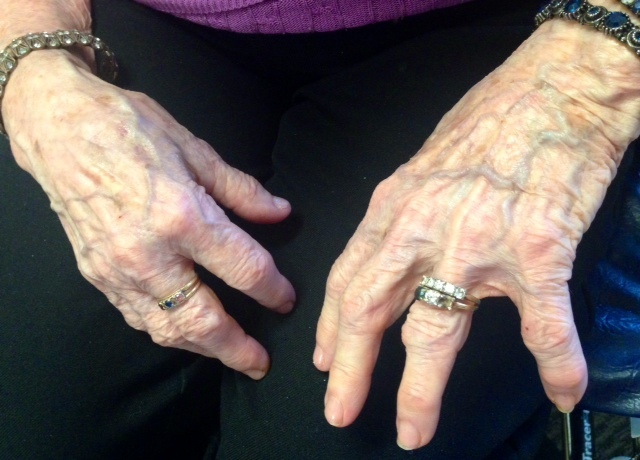 I met many wonderful people who worked at Mom’s various homes and rehabilitation centers. They did the jobs others don’t want to do: showered old people, changed adult diapers, fed the feeble ones. They became the family when the real family stopped visiting. Most of the facilities had regular activities and the residents enjoyed group outings, visits from entertainers, and craft projects. But many of them live their last years in quiet and lonely resignation. It’s often easier to show compassion and charity to worthy causes that include children, pets, and natural disasters. It’s not as appealing to help the elderly people, but they are the old souls, the ones who worked to build our country, fought in World War II, and faced a steep learning curve as technology during their lifetimes introduced airplane flight, Interstate highways, television, computers, and cell phones. In simpler times, they danced to jazz, Sinatra, and Glenn Miller. Now they leave the light on in hopes their adult children will visit. During my mother’s last years, before she slipped into Dementia, her once-busy calendar was reduced to simple entries: shower on Tuesday and Friday, hair appointment on Thursday, and church on Sunday. I watched the spark grow dim in her eyes, and I wept for the proud woman who once worked in the fields, held several jobs as she raised her children, and dutifully supported my father’s ambitious businesses. When she no longer remembered my name, I pasted name tags on the family pictures that lined her tiny room. “Don’t forget us,” I whispered. But, it was too late. Visit area assisted living facilities and spend time with the residents. Most of them have fascinating stories they are never heard. It’s okay if they repeat the same story several times. Informally adopt a grandparent for your family, and include him or her in your activities. Include older neighbors who need help mowing the lawn, shoveling snow, or fixing minor repairs. Volunteer to take them to doctor’s appointments, church, parades, lunch, and shopping. Many of them spend months inside without ever going beyond the facility. Offer to write letters for them or assist them call a friend or relative. My mother stopped answering her telephone when she couldn’t push the correct buttons. A month before she died, I held the phone so she could talk with her sister who lived across the country. Offer to teach a class at an assisted living facility, play the piano, record oral histories, sit with them, and go through their scrapbooks. In public, help the elderly by opening doors, giving your seat or place in line, paying for their lunch. Make eye contact and smile. Donate to worthy charities that support the aging. Become involved in groups that include work with and for patients with Alzheimer’s and dementia. Encourage your family to participate in your work with older people. 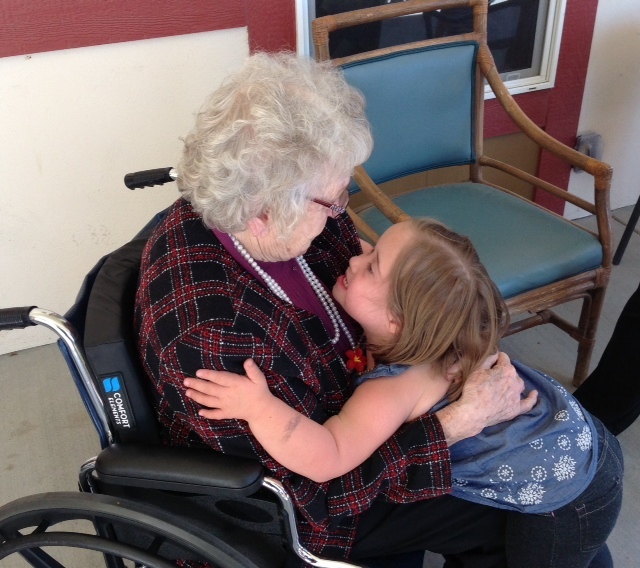 Children are often hesitant to reach out to older people, but the old souls crave a child’s touch. My mother passed away on a cool but clear November morning. 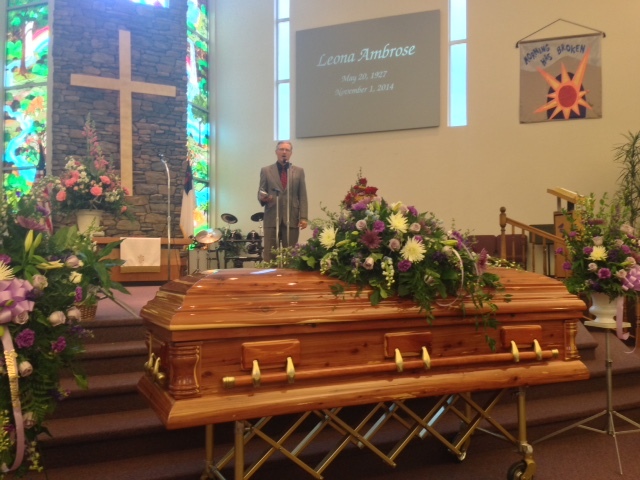 My children, her legacy, delivered her eulogy. I’m still going through all the articles she left behind, including several well-worn Bibles. Many passages were underlined in ink, and she had placed smiley-face stickers on her favorite verses. Even in death, she made me smile. Elders in our society have lost the place of reverence they once held. It is a shame, they have so much to offer. The elderly are often overlooked so I am particularly glad you wrote this piece. My dad suffered a stroke 15 years ago. He is still with us and his memory is intact but his body has been through so much. At the various rehabs where he was in and out (he is home now with mom) the care he received ran the gamut. The ones who showed compassion were extraordinary. As his daughter I also had to do some things for him that I never imagined I’d have to do. But I always wanted this gentle man to receive whatever care he receives with dignity, and so with love I helped however I could. The entire family does. Beautiful reminder. I think that often the elderly lose visitors because of their loved ones’ inability to deal with the pain and loss of seeing them go downhill. If it’s hard for the family, think of how hard it is for the person actually going through it. I have lived with this close up and it rips your heart out. It also makes you more compassionate and wise than you can imagine if you stay the course. We all deserve a hand to hold at the end, and on our often long journey there. I love this piece. I’m very sorry for the loss of your mom. It’s painful to think of the elderly growing old and lonely so we tend to turn away. I know I’ll be calling my 84 year old grandmother as soon as I know she’s awake. Thank you for sharing this story, and some ways we can take action. Thank you! I was a nursing home social worker for much of the 1990’s because I thought it important, necessary and a place where I would learn a lot. Much of what I learned was that many families consider you to be indentured servants who were constantly telling us how to do our jobs and not telling us about their parent—what they would have wanted if they couldn’t speak for themselves, what and who they were in the years before the end was coming. And I can intellectually understand not wanting to visit a parent who is no longer the parent you remember. But I can never understand not actually visiting. For we really don’t know what the resident remembers or how she feels. What she consciously feels and what she feels in her body can be two entirely different things. I can obviously go on for this forever! SUCH A moving post…even more meaningful to our age group.